"Tuniq considers itselves in fashion business of computing industry. We are committed to bring stylish, durable and high performance equipments to the world of computer modding." 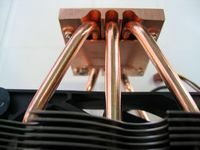 The current Tuniq line up consists of a case (the Tuniq Symmetry 1), and a CPU cooler (the Tuniq Tower 120), which is the subject of this review. From the promotional image above we can see that the Tuniq Tower 120 is a large cooler sporting a copper base, the increasingly popular heatpipe cooling technology, and (as the name implies) a 120mm cooling fan. Let's take a look at the review sample and see what else the Tuniq Tower 120 CPU Cooler has to offer. Just from the specifications we can understand that this is a large cooler! The weight is cleverly presented minus the fan in order to make it seem a bit less. 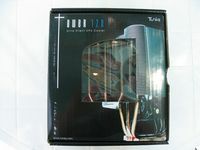 The Tuniq Tower 120 CPU Cooler is sold in the box shown below. A little window provides a peek at the aluminum fins of the radiator, and once the box is opened you get a look at the whole, massive thing. The cooler is well protected in a pocket cut out of the packing foam, and each component is equally well protected in its own little pocket. 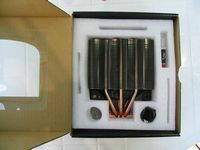 The Tuniq Tower 120 uses 6 heatpipes (actually 3 U-shaped pipes) to carry the heat from the copper base up into the massive array of fins in the radiator. 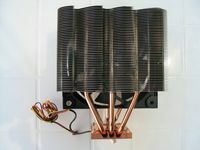 A unique twist on this popular form of cooling is that the 120mm fan is mounted in the center of the radiator, what they refer to as "Midship Ventilation". 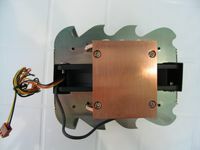 The below right image shows how a copper plate sandwiches the heatpipes between it and the copper base. The images below provide a couple looks at the base of the cooler. 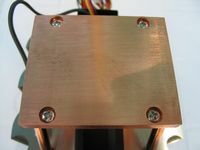 The entire block is copper, and the four screws shown are used to secure the plate that sandwiches the heatpipes in place. The finish of the cooler's base is not particularly well finished, but it is smooth and flat.